Freeform Table Runner is easy peasy fun! 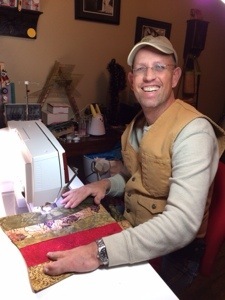 My first artful quilty teaching will be in February! I’ve put my body where my mouth is and have volunteered to teach a fabric art class. February 22, 2014 will be my big debut. I wanted something that anyone can do, something quilty, and something fun. What to do? I have so many ideas but some needed a little experience. I tossed around the idea of a fused art piece and that is a real possibility because you don’t have to sew if you don’t want to. The idea of doing self portraits using fabric, fibers and other stuff crossed my mind. But that is probably a 3 or 4 meetings type of thing. A fast piece applique using Rose Hughes technique is on the list for sure. Finally I settled on doing something that looks hard, but really isn’t and can be done in 3-4 hours. We are going to make.. drum roll please… a wonderfully wavy free form table runner. If my He-man Texas Cowboy husband who has never ever sewn on a machine before can do this, you can too! I needed a crash test dummy to try out my class. I wouldn’t want to get myself or my students in over my head. I needed a never ever sewed in their life ultra beginner. After cajoling and promising delicious food I finally talked my cowboy horse loving Texas he-man husband into it. He had never ever touched a sewing machine in his life before. Perfect! I set a timer and we started. And.. Viola! He did it! If I add a half an hour for setting up and settling down, the class should do this in three and half hours. Below are pictures of the he-man’s first quilt and couple of other samples, two use batiks and the third uses a wild design and some textured prints. He wanted red, bright red. I like his fabric choices a LOT! I suggest choosing one focus fabric, something super bright, crazy, different, or big print. And choose the rest as more solid, or finer textured to go with it. That kind of combo seems to work out best. But there are no rules in this class for fabric choices. If you love it… do it! What makes this so easy? No straight lines! You don’t have to sew straight. What makes this so fun? Every student will make a unique artful free form table runner just their own. Never-Ever’s and experienced beginners will all be successful. This is free form quilting… easy, no rules, no straight lines, no quilt police looking over your shoulder! Yourself ready to have fun, learn something new, and take home a wonderful unique artful piece for your home or a gift. Fabric You will need one piece 15-16 inches wide and 5 pieces of fabric about 6 inches wide cut selvage to selvage (selvages are the edges of the fabric, not the cut edge, this will be about 42-45 inches long). Optional: for a $10 fee, I can provide a kit of five fabrics for you. Color choices limited to stock on hand. Browns, pinks, blues, greens all batiks. If you choose to bring your own, keep in mind that many similar printed fabrics side by side may get lost in each other. For success choose one really wild crazy fabric and pair it up with teensy prints or solids that complement it. Batiks or hand dyed fabric are wonderful for this type of free form craziness. Suggestion, choose one really wild or colorful fabric that will standout from the rest. These are only suggestions, if you have a wild crazy idea, just go for it! Thread is necessary and we will have neutral and black on hand. If you want to use thread to match your fabric, pick a thread which will go with all 5 fabrics you have chosen. Batting is the stuff that goes inside the quilt to make it have shape and body. We want a thin batting that will take 8-10 inches between quilting stitches. This will hold together better. I suggest Warm and Natural batting or any other that will accept lots of space between stitches. You do not want the all polyester with 3-4 inch between stitches. It will be too puffy for a table runner if you ever wash it, it will puff up. Sharp Scissors or a Rotary Cutter would be even better. If you have a rotary cutter bring it with a fresh sharp blade. If you don’t know what one is.. that’s okay. Bring scissors, sharp ones. I will have a rotary cutter so you can try it, but the class will have to share if they want to use it. Sewing Machine If you have a sewing machine in good working order that will stitch a straight stitch and a zigzag stitch, bring it too! Make sure it’s working before class. If you don’t have one, don’t worry, contact me before class and I can arrange to have one available for you (limited to 6 students). Presser Foot Yes, I forgot to take this vital part of the sewing machine with me to a class once, make sure you have at least the regular straight stitch foot. If you know what a free motion foot is and have used one, bring it. We won’t teach it in class, but you can certainly play around on this project with it. Except for the cost of supplies, all proceeds from this class will go to the Texas Art League to support their gallery space and future classes. Lembo decided to spice it up by choosing a bright red as one of his colors. The red really adds some pop! Previous Previous post: I have cancer, I’m not dead yet!